This beautiful glass beach is sort of a hidden gem of Nagasaki Prefecture. I’m not even sure it shows up on most tourist site lists, but it’s definitely a sight to behold, and walking on it is definitely an intriguing prospect. From afar, this section of Morizono Park looks like just an ordinary beach offering a gorgeous view of Omura Bay, but as you draw nearer, you notice that the glistening sand is not sand at all, but finely ground and rounded pebbles of multicolored glass. SoraNews24 reports that a few years ago this magical place was an uninviting rocky outcropping that would always become covered in algae during the summer season. This algae would then start to decompose and drive people away with its horrible smell. So local authorities started looking for solutions and ultimately decided to take out the rocks and cover the beach with pulverized recycled glass in order to prevent the algae from growing. Not only did the glass fulfill its practical purpose, but it also created a stunningly beautiful tourist attraction. Swimming is currently forbidden at this nameless glass beach, but that’s probably because Omura City is currently working on restoring the water of Omura Bay. Even so, the small beach has already started attracting attention on sites like Instagram, and I suspect it won’t remain nameless for much longer. 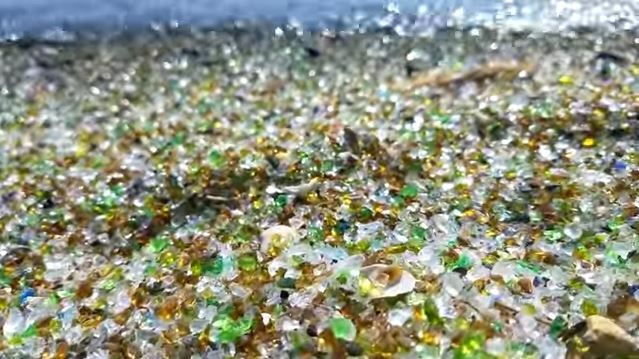 So if you’re ever in Omura City and looking for something off the beaten path, you should definitely check out this man-made glass beach near Nagasaki Airport. It looks absolutely stunning!